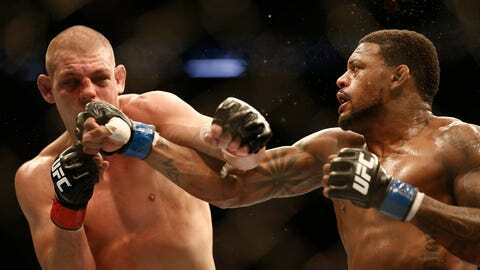 Michael Johnson's win over Joe Lauzon (left) was called 'dominant' by ringside observers. ST. LOUIS — While many of us will be enjoying Christmas Eve with our families, UFC lightweight and St. Louis native Michael Johnson will be on a plane to Las Vegas. He isn’t going to celebrate the holidays on the Strip, either. "Unfortunately, I’ll be cutting weight and worrying about my fight," Johnson said recently via phone from South Florida, where he was training for his Saturday night fight against Gleison Tibau. The three-round bout is on the undercard of UFC 168, which features a middleweight title fight between champion Chris Weidman and top challenger Anderson Silva on pay-per-view. That Johnson’s match was relegated to the second fight of the FOX Sports 1 prelims (7 p.m. Central) did not warm his Christmas spirit, either. Watch Michael Johnson-Gleison Tibau among the preliminary bouts on UFC 168 at 7 p.m. Saturday on FOX Sports 1. "That isn’t where I want to be at all, and I think Tibau and I deserve to be higher on the card," Johnson said. "I’m kind of disappointed about that, but I’m going to go out and have an even better performance (than his most recent fight) and make sure that never happens again." Another showing like his last one and Johnson will warrant an elevated standing in the UFC ranks. Fighting favored Joe Lauzon on his home turf in Boston, Johnson scored a convincing unanimous decision that ringside observers called dominant. "It was huge, one of the most important of my career," Johnson said. "He’s such a talented fighter, a veteran in this division and everybody loves him. For me to go in there and beat him the way I did was extremely huge. Not to mention, I was on a two-fight losing streak and on eggshells a little bit. It was really important for me to go in there and win the way I did." A 2004 graduate of Marquette High in Chesterfield, Johnson has been training at his new home base in Del Ray Beach, Fla. Johnson began his MMA career at the Springfield (Mo.) Fight Club while attending Missouri State, but as his career began to take off, he hooked on with the well-known Blackzilians so he could train with more seasoned MMA fighters. Johnson, 27, has built a 14-8 record mainly on the strength of a wrestling background and his jiu-jitsu training. In Tibau (37-9), he will be taking on a far more experienced opponent but will be fighting for the fourth time this year. It will be Johnson’s third fight of 2013. "I couldn’t be in any better shape," Johnson said. "I feel strong, focused and ready to put the pressure on my opponent to see if he can handle what I’m bringing into the cage." Johnson is no stranger to working during the holidays. He lost a unanimous decision last Dec. 29 to Myles Jury in the same venue where he will be fighting this week, the MGM. While he would prefer to be home like most of us, he doesn’t mind delaying his Christmas. A victory, of course, would help make the wait worthwhile.